Welcome to spring! At least that is what it is in our area after another relatively mild winter and very little snow. However, we did have a terrific ice storm in January that caused millions of dollars of damage to homes and trees. Anyway, it won't be long before every day is good for golf; there's never been a bad day. Speaking of golf, I play with a group from my church including our minister; this group hasn't necessarily improved my golf game but it has certainly improved my language! I am sorry to report the loss of two more shipmates since my last letter. The first was Wallace Thorpe who passed away on January 8 after a long siege of illness; Wallace was with us at our San Diego reunion in 1992. The second was Don Hewson who left us on February 25, also, after a lengthy illness; Don attended everyone of our reunions plus the mini-reunions on Cape Cod and at Baton Rouge. While aboard the FULLAM, Don was the "impresario" of those memorable "FULLAM FOLLIES" that we all enjoyed on several occasions in the South Pacific. Many of our shipmates thought that Don was "Snoop" aboard ship but I have never been able to verify that. I learned from John Barton that we have another O'BRIEN survivor on our current roster and that is Homer "Whitey" Iredale, our former ship's cook. I have received some great letters from Rich Fernandez, Garrett Lynch, and Arch Kellems, describing their personal experiences when the O'BRIEN sank; I hope to include parts of these in future newsletters. "You might want to refresh my memory as to Dad's actual command dates aboard the FULLAM. My only time aboard this vessel was in Norfolk just before she was sunk as a target (July, 1962). Dad was in command of the USS OBSERVATION ISLAND (EAG154). I went with him aboard ship to the yard for a 2-week period and this is when we saw the FULLAM. She was in a stripped down state but Dad was able to recall different events and remembered just about every space on the FULLAM." I sent Richard copies of the log that indicated the dates of when Captain Boyd took command of the ship and when he left. He advised that his mother, Ruth, has dementia and is being cared for by his sister and her husband who are living with her. I certainly remember her as a very charming lady and enjoyed being with her at our first reunion in Baton Rouge in 1988 and again at our reunion in San Diego in 1992. Included in this letter is the latest roster of those to whom I am currently mailing my newsletters. If any of you know the whereabouts of any shipmates not listed on this roster, please let me know their name and address so I may start sending the letter. Recently, Ed Summers sent me a letter along with an article about his old ship, the BENHAM (DD397); Bill Modrell also came off of the BENHAM. 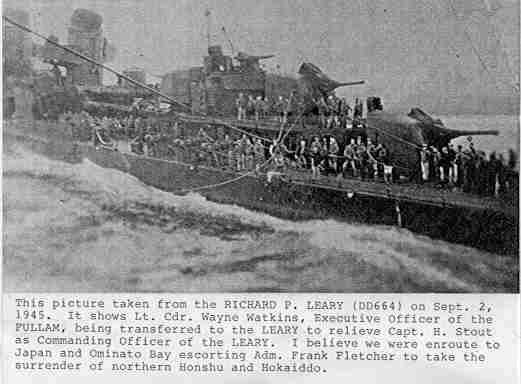 The article tells of the BENHAM taking on 925 survivors from the Y0RKTOWN and HAMMANN which were both sunk at the Battle of Midway. This number of survivors was believed to be the largest number taken aboard one ship during the war. If any of you would like to read this article, let me know and I will send it to you; it's unbelievable to think that a destroyer could handle this number of additional personnel. Ed also sent a personal memory which I plan to include in a future letter. Out of curiosity one Sunday I looked up hymn #474 in our Presbyterian hymnal. The title of this hymn is "0 Splendor of God's Glory Bright". When you think back to all of the various actions we were involved in and the many, many opportunities we had of being damaged or sunk and only ended-up with just one Purple Heart, maybe we did bask in His splendor!